Did I Miss Something Or Are We Starting To Forget This Guy? I mean, November 22 came and went and I don’t recall hearing/seeing a thing anywhere about his assassination. Could it be we are burned out with conspiracy theories and bullet trajectories and grassy knolls? I’m not a great worshipper of all things Kennedy on the political stage, or even in martyrdom, but the family has served the country in peace and war, and a number have died in the process. Their politics might be debatable but you can never doubt their patriotism. President Kennedy was part of a simpler generation and in the short time he served he did manage to affect the world stage, even to this day. Not a bad thing to pause a bit to historically reflect on that alone, if not for the man himself. Maybe a half century of public mourning is enough for any one president. The “how” he died is less important these days than what he started. That’s all I gotta say on the subject… maybe until next year. 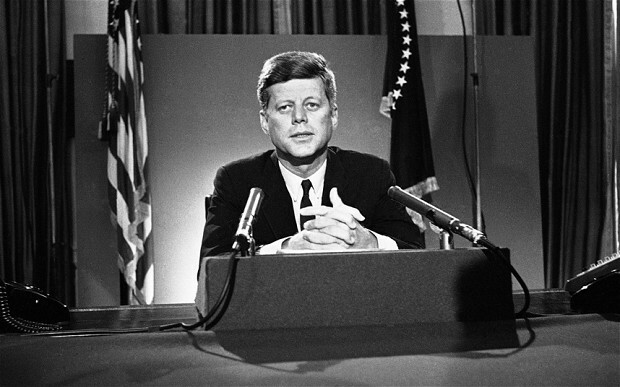 This entry was posted in Current Events, Politics, Politics & Religion, Social Issues, Social Unrest, Social Upheaval, Space, The Final Frontier., Television, Viet Nam and tagged 11/22/63, conspiracy theories, grassy knoll, JFK, jfk assassination, president kennedy, rememberance jfk, second gunman. Bookmark the permalink. Today when I was standing in the grocery store line I saw a Tabloid (ya, okay I’m ashamed I was even looking) that said “Miley Cyrus now dating a Kennedy”. That’s what it’s come down to. Sad. I’ve often wondered why the TV documentaries have always played the same clips over and over again. Last year I watched an amazing documentary with clips I had never seen. I have a DVR, so I kept rewinding to hear a confused Oswald say he didn’t do it, and I kept rewinding to the odd secret service agent standing up in the car with his weapon drawn before Kennedy was shot. It catered to my conspiracy side. I have always been intrigued by Oswald, but even more so with Sirhan. I wasn’t thought of until the 70’s, but even as a child I was drawn to History’s mysteries be it the Kennedy’s, King Tut, Amelia, Hitler and now MH370. I’ve noticed that just like Kennedy seems to have been forgotten so has Pearl Harbor and other WWII atrocities. They’ve all been replaced by new stories of 9/11 and police shootings.